If you would like to be notified if we are unable to attend one of the markets due to unforeseen circumstances please click on the 'Newsletter' link where you can join 'Mail Chimp' to have regular updates from the farm. We would announce any changes to our markets via this method, thankyou. Ghee is a great, shelf-stable alternative to either butter or oil for cooking. It has health benefits which have been recognised by Indian cooks for years where it is used in traditional Indian dishes and even in medicine. When cooking, it can be unhealthy to heat polyunsaturated oils such as vegetable oils to high temperatures, doing so creates peroxides and other free radicals. Ghee, however, has a very high smoke point and doesn't burn easily during cooking. Ghee has stable saturated bonds and so is a lot less likely to form the dangerous free radicals when cooking. The Ghee is made by melting and simmering our raw butter until all the water evaporates and the milk solids settle at the bottom of the pan. After the Ghee is made it is allowed to settle and cool down naturally at room temperature. When cool, the product has a ‘grainy’ texture which disappears quickly once the product is warmed. Ghee contains both hard and runny parts at room temperature, if you like to use Ghee as a spread it may be a good idea to keep some in the refrigerator for this purpose. All of our Ghee is made from our own organic raw butter. Each pack of butter is handmade, churning just the cream taken from over 9 pints of organic, raw, whole milk. The milk is from our herd of Holstein Friesian cows that feed on our own organic pasture in the summer months and our own organic silage and bespoke supplement in the winter months. Ghee may be unfamiliar to many Westerners, but has been used for at least 2,000 years, and comes with a host of benefits listed in traditional Ayurvedic texts, where ghee is seen as a vital food for healthy skin, mental clarity, and good digestion, medicinal and rejuvenating qualities. (Ayurveda is the ancient natural healing system of India.) Ghee is a Sanskrit word for clarified butter. Ghee is traditionally kept, sometimes for months, without refrigeration. It is best kept in a darkened cupboard. Butter will eventually turn rancid if kept at room temperature, ghee will not. It is the moisture in the butter that promotes decay and as ghee is virtually moisture-free is has no such problem, and will retain its original freshness and flavour for months, even without refrigeration. Ghee is, therefore, a practical way to preserve butter. As a dairy product, ghee is very low on lactose and generally, people who have a lactose intolerance can consume a small amount of ghee. Storage: Ghee will keep for up to 3 months in your kitchen cupboard (away from light, not kept on the worktop) and you can refrigerate it for up to a year. Ghee will become hard in the fridge; however, it will become soft again once you take it out and leave it at room temperature. Do not let any moisture get into your jar, as this can promote bacteria and spoil the ghee so make sure that you use a clean, dry spoon. If you buy a large jar of ghee but don't plan on finishing it in 3 months you may consider transferring some ghee into a small dry sterile glass jar for your kitchen cabinet, and then place the larger jar in the refrigerator. Most of all enjoy your ghee! Make Cottage Cheese see our website for recipe. Saturday's we are back in the High Street. This is one of the smaller markets but incredibly busy! Here you can meet Phil Hook who owns the farm with his son Steve ( Steve covers the market when Phil is on holiday). Phil would be delighted to meet you and offer a sample of our milk before you purchase. Our Raw Organic milk is supplied in a 2 pint Poly bottle for £3.00. Here you will also be able to purchase our delicious Raw Butter and Cream it sells out incredibly fast so you need to get there early! Most week’s Phil will have some Organic Rose Veal available. All other dates at main location. Eastbourne Borough Market which is held every Wednesday 9am-4pm Terminus Road, Eastbourne, East Sussex between Debenhams and TJ Hughes. 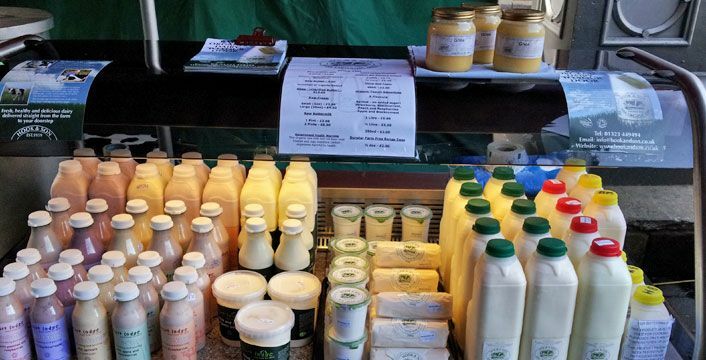 Tony will be there to help with your purchases, you can even sample our lovely Raw Organic milk before you purchase it! For more information click here we look forward to seeing you there! Crystal Palace Food Market is a Crystal Palace Transition Town project. It is a community not-for-profit market, with all the work carried out so far by volunteers and all the profits used to help support their ‘Patchwork Farm‘ project. One of it's aims is to support small sustainable farmers - so all the farm produce is organic and mainly from small farms close by in Kent & East Sussex. Come and find us at Borough Market. 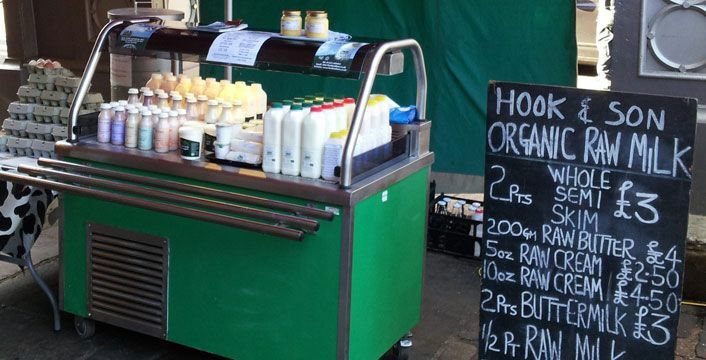 We are in Three Crown Square, the Market’s largest trading area which is devoted to fresh produce, including our wonderful raw organic milk. You can meet Colin on Thursdays, Chris on Fridays and Kate will be there on Saturdays to help with your purchases. this market is right at the heart of bustling Station Square shopping precinct.